When you venture out to find quality home furnishings to change the look of your house, you need a starting point, an element of inspiration upon which the final results will rest. Choosing area rugs can be paralyzing if a person doesn’t start with some direction. Industry leaders suggest choosing one item to anchor the room, one distinctive piece that will set the parameters for all of your other choices. Good interior designers say that a well designed room is built from the area rug up. Like purchasing wall art, there is a lot to know about rugs, and your decision should be an informed one. 1. When looking at area rugs, try to find one that will make you smile every time you look at it. Crafted from colors that reverberate with history, and designs that come from the heart and mind of the individual creator, a quality Oriental area rug will bring a distinction of taste and depth to your living space. Providing warmth for your home is an investment in itself. Pay attention to how a space makes you feel and don’t pretend to “like” ideas based on trends. An area rug should comfort a room and your soul. 2. Take your time when choosing an area rug as it will be an heirloom item you can pass down for generations. Investment in a rug as a functional art piece will get your creative juices flowing. If you choose wisely, a rug will be the one part of your room that you will never have to change. It will provide a road map for your design without setting mind-numbing limitations. 3. Choosing area rugs based on function. Many home designers are surprised to learn that Rugs from Tibet, Turkey, Asia, Afghanistan, Romania, India and Pakistan may have very different styles + textures and durability. It’s important to discuss your specific needs in choosing an area rug. The wear and tear of pets and children and just general traffic can be hard on any flooring. That’s why a quality rug is so perfect for the active home. They are durable, easy to clean and the natural pigments resist soil and fading even in the harshest environments. Kilim area rugs represent a perfect example of a great durable and brilliant art piece. Just have a look at the many Kilim area rug applications here. It’s important to discuss your needs with a reputable area rug dealer before purchasing. Pangaea can help! Just contact us or call us at 303-679-4447. 4. Ensure that even after purchase, your area rug dealer will honor exchanges in a given time frame. Most good area rug dealers will not only help select a rug, but come to your home, install and offer exchanges to ensure customer satisfaction. Many high volume vendors like Restoration Hardware or Pottery Barn charge like prices, but do not offer such high end services. Why not get the bang for your buck and accept professional design help? Use this rule of thumb: Choose an area rug that is at least 6 inches from the wall but no more that 2 feet. In large spaces, purpose two area rugs for some depth and interest. In living rooms, area rugs should extend beyond the coffee table and at least the first set of legs on sofas. Pangaea Carpets offers unparalleled service before, during and after your area rug purchase! Just give us a call at 303-679-4447. 6. Make sure the area rug is sourced from an ethical dealer and is created by a skilled adult artist. The sale of ethically sourced fair trade rugs allows the weavers to earn a living wage while their children are in school. The best of this category are Rugmark-Certified or GoodWeave certified, meaning that the carpets are made in safe and fair working conditions without the use of child labor. The Rugmark and GoodWeave labels ensures that the carpets are created out of natural organic wool and are dyed with botanical pigments. 7. Visit a home furnishings showroom (instead of purchasing online) to see and touch the brilliance of your area rug. The web is a great place to do…well a lot, but nothing comes close to the real thing. Inspecting the brilliant texture and color in an area rug gives you a new level of design aesthetic. What looks great on a screen, may not even come close in reality plus, a home furnishing showroom offers tons of ideas! Choosing area rugs can be a fun process if you know where and how to shop. Finding an art piece for the home and designing around it, is a great anchor for any space. Even if you have no experience with interior design, give it a try…there is no wrong answer! Did you like this post? Was it informative? Give some feedback below or share your area rug designs on our facebook page! I did not know about how far from the wall. .etc. I am so pleased to find this article! I always struggle when I’m buying rugs….they always end up being too big or too small. 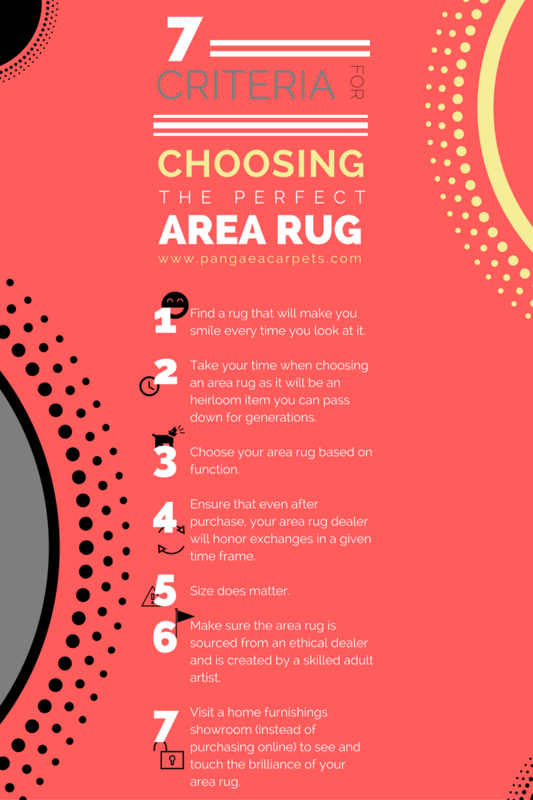 These tips are very helpful for choosing right area rugs. Thanks. Beautiful infographic! I definitely need to hire your graphic designer. Thanks for the article. The material used in making the rugs is also very important to consider. Avoid cheap synthetic rugs as they won’t last as long. Do you want your house to be spectacular, go for a woolen rug or any other piece made from natural fibers.